Recognition, sales and service awards play a very important role in employee motivation. 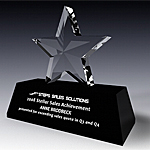 However, another major benefit of sales and recognition awards is often overlooked. Recognition awards are vital in increasing sales and promoting consumer confidence in the businesses. Have you ever walked in your local bank branch and noticed a "best customer service" award plaque on a desk of a bank associate? Naturally you will gravitate towards the desk with the award, because it subtly advertises better service. Displaying the "best customer service" award in clear view of potential customers is a great business decision because it significantly raises confidence in products or services. Thus a recognition award is used to boost customer loyalty and promote new business leads. Achievement awards such as high "safety", "quality standard", "consumer&apos;s choice", or "best in its category" are also great tools in generating more business. Awards can be used to advertise beneficial value of a product or service and increase profits. Consumers often choose to pay premiums for better quality or safety products if they are aware of the superiority of their choice. Advertising accomplishments and achievements reinforces consumer&apos;s belief in getting a better product. That&apos;s exactly why "award winning" movies are rented more often. Businesses can advertise their accomplishments in forms of awards . There are many ways to reward outstanding performance with corporate incentives. Consider the following reward program recently executed by a mortgage brokerage. With a budget of $200 per person, the human resources department developed a creative motivational program to recognize top sales performances. The choice was between a cash bonus performance reward, recognition gift or an award. Although cash bonus seems like an obvious choice, many studies show that recipients soon spend the money and forget about the reward. A meaningful recognition gift , such as clock or a desk accessory, offers greater benefits in terms of the reminding the recipient of their achievements. However a recognition award displayed in a visible view of colleagues and potential clients is event a better reminder of high performance. Therefore, the brokerage chose crystal awards to recognize sales performance to the top producing associates. The awards boosted client confidence and generated even more sales. 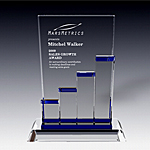 Moreover, sales associates who did not receive an award improved their performance because they realized the benefit of having a recognition plaque on their desk. The most popular categories of corporate awards are: recognition, sales, performance, achievement, appreciation, best in service, best in quality, standard met, quota met. "If you got them flaunt them" applies in this case. When presenting a recognition plaque, encourage the recipients to display it in a prominent spot, high traffic area, such as next to a window or on a desk. In conclusion, awards serve a dual function of recognizing performance and advertising corporate achievements. Recognition awards communicate a strong message to the consumer that the organization, its products, services and the individuals are the best in its class and have been acknowledged for it.